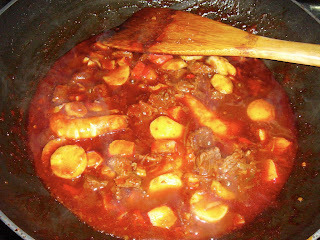 This morning, my mom wanted to cook 'Asam Pedas'. I noticed that the fish's tummy was ridiculously huge. 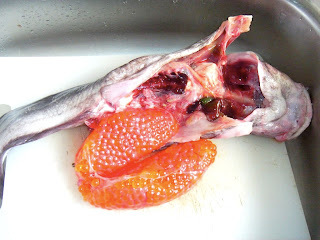 "Ma, I think there's roe in there. The stomach is so huge! Pregnant lah!" I told my Mom. "No ... I guess it's just the stomach guts, you know how when you eat too much you get bloated.." My Mom responded. Oh Alright then. Hmmph! A while later, she called out to me and exclaimed. "Sheikha! Got Eggs inside la!!!" 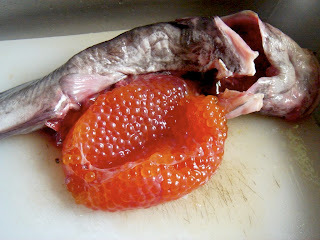 So I rushed to the kitchen and whoooaa mama.... fish roe alert! Beautiful ain't it. 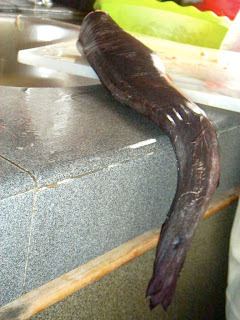 *you must think i have gone bonkers to think that* People use roe to make sushi, i presume? Hmmm.. my sister PhiQue would've loved this. 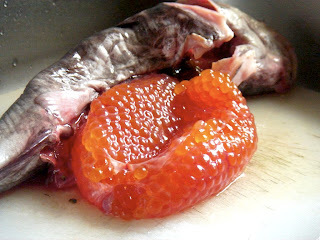 See how bright orange and huge a single roe is? It's just soooo alien-like. Gut wrenching. You can even see the green bile in a corner. 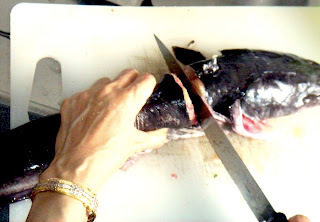 The bone is rock-hard, my mom had a hard time cutting the fish (sans whiskers). Its eyes seem to be staring back at you in an eerie ominous way. It's really bizarre! 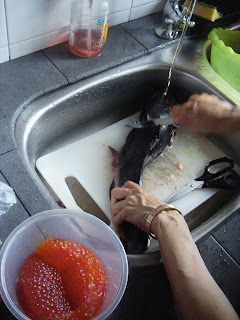 Mom did the honours of chopping off its head. 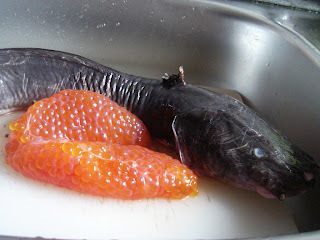 P/S: I do not even dare to eat the Asam Pedas Fish that has been cooked. I was totally grossed out. Sorry Mom. I L VE You with All my Heart! They waited, They bought the parallel import ones, They travelled to buy or even asked friends to buy, They paid quite a sum for it, They queued when Singtel announced that they'll be selling it, They're still waiting for M1 & Starhub to sell. I got it. For free with no lines or contracts. A 16gb 3G Iphone. Yes la! Hello to the Blog world again after missing so much. Yesterday was a memorable morning for me. The office announced that we will be having our very first Christmas Gift Exchange party & as well as some announcement & lucky draws. I myself have never been to any sort of Christmas gift exchange party before. Even when I was in Primary School, the teachers gave us presents instead of exchanging it. The twist for the gift to exchange was it has to be $10 & above, no chocolates/sweets, no Nike products & no Celio products. So guess what I bought? A weighing scale from Watsons that has Mickey Mouse design on top of it that cost $11. HAHA Good luck to the person who gets it yesterday. Reality check mate! 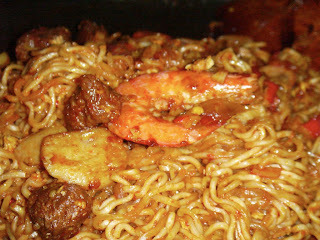 Hon has always been craving for noodles everytime he comes home from work because it is lighter than rice. A less starchy meal before sleep. Since he comes home around 11pm almost everyday, I have time to think of, research, and cook up a little somethin' somethin'. 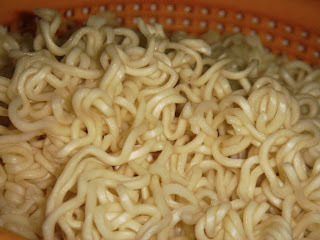 So for today, Maggi Goreng struck my mind. 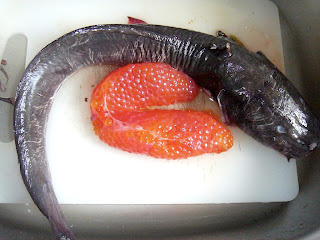 Both of us love chilli padi and how it burns the tongue and makes your eyes swell up. And how we have to reach for our cool ice orange squash to quench the thirst and put out the flames to a sizzle. Check it out. 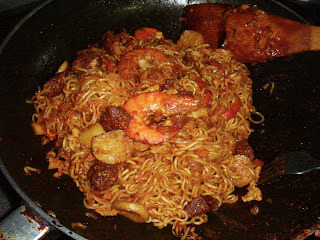 My Maggi Goreng turned out to be a success. Haha! Nunu, as promised. =) Nothing much, though. SheZai caught the movie "The day the earth stood still" last night. It is a remake of an old movie and it has been tech-nano-logisized. Quite a good movie i must say. Hon agreed too. Keanu Reeves still looks dashing compared to the time he acted in Speed. He is an alien trying to save the earth...... "from us". - Watch out for this line. Haha! You'll go... "Ooooohhhhh". Catching "YesMan" next. Tomorrow is gonna be a boring Sunday. Wonder what will I do. I hate to go shopping during this festive season. The crowd is just unbearable! So thus, I think I will just stay home and think of something exciting to do. .... ...... like.... ...... ..... clean the toilet.... NOT. P/S: This is our 450th blog-post since 2003. Quite a history, this blog of ours. It survived the test of time. Thank you SheZai Readers! 5 years of memorable archives to read! Tomorrow, Hon is having his Off day. And SO AM I!!!! Hahaha! No need to go to work since it is centre closure for the other teachers to do their thang so the principal asked me to take advanced leave.. And then the best part.... No lecture in the afternoon too because the lecturer is just so nice to let us have our 'Library Time'. But for me, that means, "reading-at-home-so-no-need-to-go-school-and-can-wake-up-late-until-have-no-time-to-read-because-I-go-on-a-hot-date-with-hubby" time. Hahaha..... Typical student or what. Reminiscing the ol'skoolin' times indeed. I want to blog... but work stopping me. Later k? However, today was the most heartwarming day ever since i started work. I was interacting with the kids and playing with them. Suddenly, a 4 year old girl in my class came up to me, put her arms around my right leg (since i am wayyy much taller than she is), basically hugging my leg, looked up at me with her beady little eyes and said, " I love you, Teacher Sha!" Awwww... My heart just melted there and then when i said, "I love you too, Kathy!" and hugged her tight. The whole atmosphere in the childcare centre is so full of love, hugs and kisses! Everytime a child goes home, he/she will give a big hug to all the teachers and greet them, Goodbye Teacher A! Goodbye Teacher B! Goodbye Teacher C! So tata-tertib kan. I just love observing them!